We had our busiest year yet in 2016, donating over 4,000 children’s bicycle helmets. Here are a few of our recent donations. We thank our partners Bike Milton and the Westwood Pedestrian & Bicycle Safety Committee. Breakstone, White & Gluck recently donated 100 children’s bicycle helmets to Bike Milton, the town of Milton’s bicycle committee (photo above). 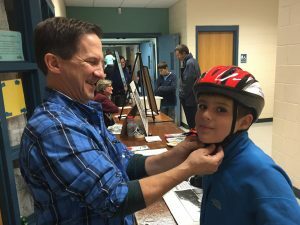 On Oct. 2, the Bike Milton distributed bicycle helmets to children at Celebrate Milton, and showed children and parents how to properly fit the helmets. Bike Milton also gave away free bike maps and shared information about the town’s new bike lanes. The Neponset River Greenway extension is also opening soon, which will allow cyclists to ride safely on a protected path. The path runs through Milton, Dorchester and other communities near Boston. Bike Milton is an active partner of the Safe Routes to School program, which works in schools across the state to teach children how to ride bikes and walk to school safely (Breakstone, White & Gluck is also a supporter of Safe Routes). Bike Milton is an advocate for safety and has campaigned to make the intersection of Neponset Valley Parkway, Brush Hill Road and Milton Street safer for drivers, cyclists and pedestrians. The intersection had no crosswalks and saw 34 reported accidents over an 8-month period. Visit their website to learn more. For the third year, Breakstone, White & Gluck donated bicycle helmets to keep the children of Westwood safe. 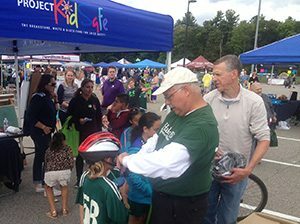 Our thanks to the Westwood Pedestrian and Bicycle Committee, which distributed helmets to children at Westwood Town Day on September 24th. Committee members also spoke to families about the importance of wearing a helmet on every bicycle ride. Attorney David White of Breakstone, White & Gluck is a member of the Westwood Pedestrian and Bicycle Safety Committee, but was unable to attend this year. The committee said all still went smoothly and they distributed over 100 helmets in three hours. Questions about bicycle helmets? Visit our bicycle safety page. Breakstone, White & Gluck, a Boston personal injury law firm, is committed to the safety of all bicyclists in Massachusetts. We have over 100 years combined experience representing bicyclists injured by the negligence of others. If you, or a member of your family, has been injured in a bicycle incident, please feel free to contact us for a free legal consultation at 800-379-1244 or 617-723-7676 or use our contact form. Thank you and RIDE SAFE!